The Shadow tech Goddess is the main story in the “Turns of the Shadow tech Goddess” saga, dealing with the concept of love and alternate realities. Beware the woman who does not exist, yet is everywhere. Paymaster Stenstrom and his Countess-in-Waiting, Lady Gwendolyn of Prentiss, are paid a bounty of riches to perform a simple task, and then everything changes. The weight of the Universe comes down upon them. Paymaster Stenstrom learns he is in the gaze of the destroyer of universes, the Shadow tech Goddess, and also that he is in a race with sinister forces hoping to curry her favor and bring about the end of all things. It is a race he and Gwendolyn must win. They will investigate ancient places hidden in plain sight and travel to long lost worlds unseen in ages. They will feel fear such as they have never known and walk in a Garden of Horrors where all is revealed and Stenstrom comes to know the truth of his place in the universe. The Shadow tech Goddess silently watches the doings from her throne in the Hall of Mirrors, seeing all, collecting information, and her verdict might finally be cast one way or the other. 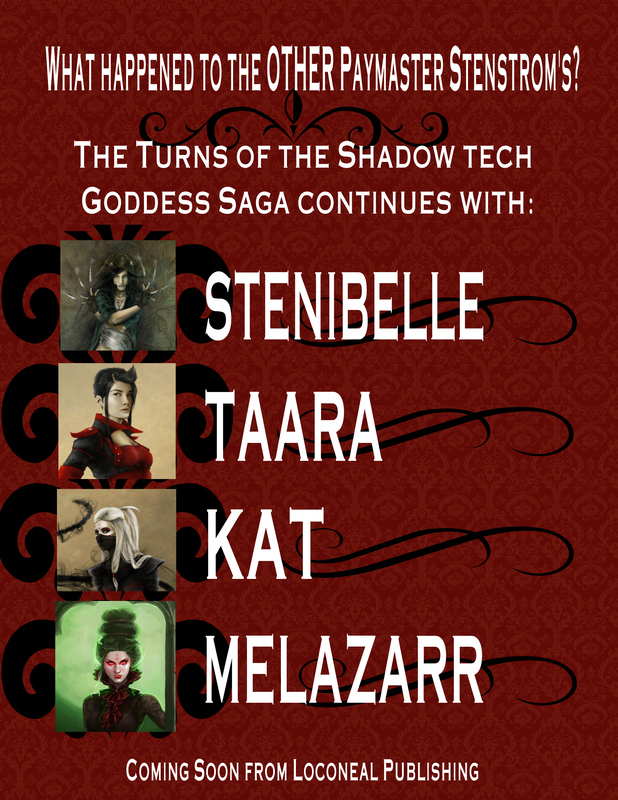 The story will continue with The Turns of the Shadow tech Goddess saga, where the doings in alternate universe are explored. In an alternate universe, Paymaster Stenstrom is not a man and the House of Belmont-South Tyrol is on the verge of extinction. The disgraced 30th daughter of the House of Belmont will either be the final stake driven into its dying heart, or the ray of light that comes to save it. Can a crass, foul-mouthed Xaphan woman from Caroline actually be the vessel carrying information that can save all things? Paymaster Stenstrom struggles to keep her alive, and discovers in the process the amazing woman hidden under all the bravado. Tiny Taara de la Anderson is Paymaster Stenstrom’s right hand, always loyal and brave. Does she dream of different things, and how far will she go to get what she wants? An old friend and an old enemy make a sudden re-appearance. With Black Hats, either you kill them or you marry them, that’s what Lt. Kilos always used to say. Paymaster Stenstrom felt the Black Hat’s claws raking his chest in the cold of the Clovis ruins, and now here she is at his throat once again. Who is Kat, and can she believed? What demands does she make of him? The Shadow tech Goddess comes to call on an old debt. Of all creatures roaming the planes, the Tempus Findal is the most horrid. She believes she has her own place at last where her insidious power will not destroy the one she loves. The Gods of Cammara will give her no rest and might undermine all she has attempted to build.